By the time this blog is published, my friend Rick Janes will be just a pile of ashes. This kind, gentle, creative person was my friend for over forty years. Now, I wish that I had spent more time with him. Life and its commitments have a way of putting a lot of time in between contacts. At times a couple of years would go by, but we would just started talking, as if it were a conversation without any gaps. Finding a way to write about the death of Rick Janes has been an impossible task for me. Even though I have known him for over forty years, I really have never known much about his life. What I know about was his humanity, his talent and unique outlook on the world. I feel I need to pay our friendship a tribute by writing about him and the only way I can write about him is through my eyes rather than his accomplishments. How I met Rick. In the mid 1960’s I attended YMCA HIGH SCHOOL, known as Central Y. It was a school made up of teachers and students who could not deal with traditional education. The school lacked in most areas of education, but was extremely rich in literature. It’s where I was introduced to Albert Camus, Jean Paul Sartre, James Baldwin, Richard Wright, Herman Melville, Charles Dickens… as a bonus, classes were from 8:30-12:30 and it was located in the heart of downtown Chicago, which had a plethora of movie theaters, and I frequented all of them, but that’s a story for another day. The student body at Central Y was made up of a mishmash of Chicago neighborhoods. We were the long hairs (before the word Hippie was coined), the south side greasers, a small contingency of Hyde Park intellectuals, members of the Black Power movement and several nondescript pill poppers and glue sniffers. Sometimes the Hyde Parkers would mingle with the long hairs, especially if Bob Dylan’s name came up in conversation, but other than that, the student body of Central Y was a prime example of what Martin Luther King called Chicago, the most segregated city in America. I was having coffee in the YMCA cafeteria when I first met Rick Janes. He was not a student at the Y; he wasn’t a student anywhere. Without introducing himself, he started mumbling to me in his soft low voice. He was funny, smart and sarcastic, and we immediately became friends. I found that he was a guitar player, which our band needed; I invited him to rehearse with us that night. His playing and personality suited us. 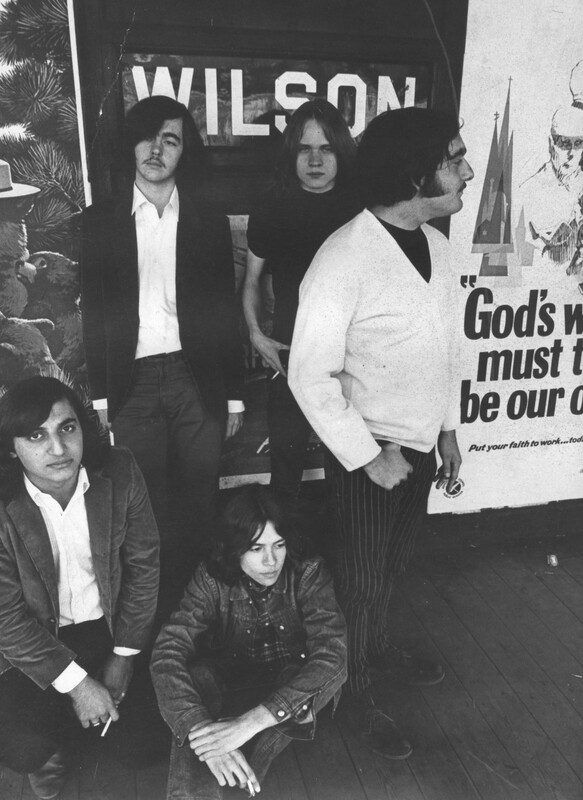 Me, George, (back row, Russ, Rick) to the right, Steve, he was not a member of the band or even a musician, but our manager set up the photo shoot and we were without a drummer so we asked Steve to stand in (it made sense at the time). 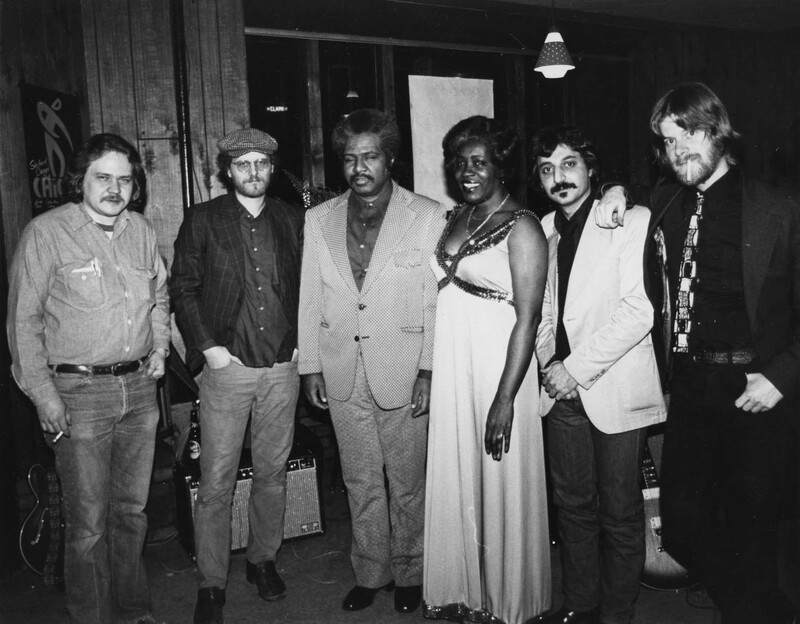 Musically, it was a time of great discovery, Frank Zappa and the Mothers of Invention, Lou Reed and the Velvet Underground and the Chicago influences of Howlin Wolf, Buddy Guy, James Cotton, Junior Wells and the Paul Butterfield Blues Band. The jazz world was exploding with the new sounds of John Coltrane and the Avant Garde movement of Ornette Coleman, Albert Ayler and the Association for the Advancement of Creative Musicians (AACM), which is still going strong in Chicago. I think our musical search and trying to find our uniqueness is what bonded Rick and I forever. We spent hours upon hours of just the two of us improvising. There is something very intimate about communicating musically. By 1968 the world had changed for me, it was time to pursue my other interests of photography and filmmaking in earnest. After film school I moved to California for a five-year period and lost track of Rick. 1980, back in Chicago, I ran into Rick and he talked me into starting a band again. I saw that the Cubby Bear was empty in the winter, and this was a pretty undeveloped Wrigleyville at the time, I asked if they would consider putting music in there, they said yes. I called the great Chicago vocalist, Jeanne Carroll and asked her if she would join us, “oh… and if you know of any piano players, bring one along” I said. I borrowed a bass, which I had not played in over ten years, and without rehearsal, we met at the Cubby Bear, Jeanne called out songs and we played. Jeanne brought Danny Riperton to play piano. Danny was Minnie Riperton’s brother of the Rotary Connection fame. It was actually a very interesting band, but no organization. Other than Jeanne, we also featured George “Wild Child” Butler, a great harmonica player and one of the most soulful musicians I have ever met. I never regained my musical abilities so I soon left the band. I lost track of everybody with the exception of Rick. This is was the period when I really started to get to know him as a man and as a creative artist. Beyond his great musical ability Rick produced some unique and wonderful art. This piece hangs in my apartment. It’s called Monk Fish. 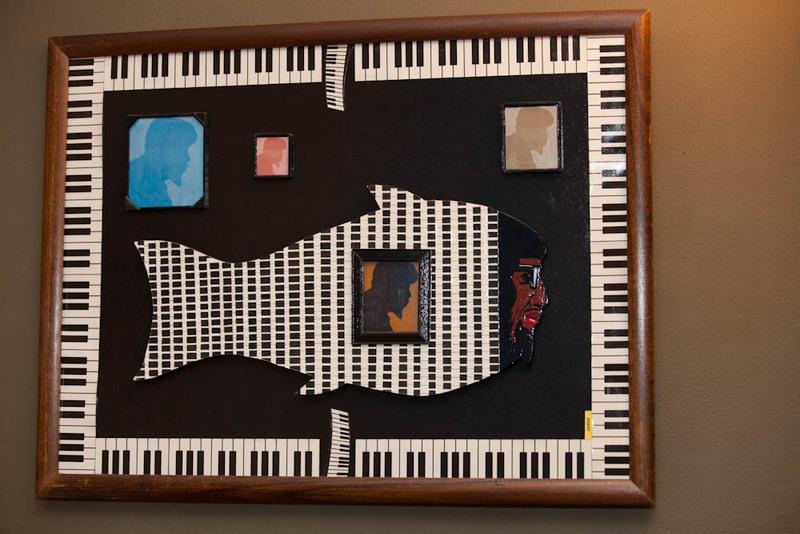 It’s the head of Thelonious Monk in a body of a fish surrounded by a keyboard. I think its brilliant outsider art. This is from a note Rick sent me after my wife died. and when we stare into that deep void, so far away, we may think, nothing is lost, only transformed, but the likeness of you will never again appear at my doorstep. Anytime someone close to me dies I think about how I have lived my life, have I done enough, have I achieved anywhere near what I wanted to achieve, I think not. I remembered a poem by Marie Howe I heard last April (national poetry month). It’s about her brother’s death and how we go on living. Johnny, the kitchen sink has been clogged for days, some utensil probably fell down there. And the Drano won’t work but smells dangerous, and the crusty dishes have piled up waiting for the plumber I still haven’t called. This is the everyday we spoke of. It’s winter again: the sky’s a deep, headstrong blue, and the sunlight pours through the open living-room windows because the heat’s on too high in here and I can’t turn it off. For weeks now, driving, or dropping a bag of groceries in the street, the bag breaking, I’ve been thinking: This is what the living do. And yesterday, hurrying along those wobbly bricks in the Cambridge sidewalk, spilling my coffee down my wrist and sleeve, I thought it again, and again later, when buying a hairbrush: This is it. Parking. Slamming the car door shut in the cold. What you called that yearning. What you finally gave up. We want the spring to come and the winter to pass. We want whoever to call or not call, a letter, a kiss—we want more and more and then more of it. But there are moments, walking, when I catch a glimpse of myself in the window glass, say, the window of the corner video store, and I’m gripped by a cherishing so deep for my own blowing hair, chapped face, and unbuttoned coat that I’m speechless: I am living. I remember you. Nice remembrance Al, continue carrying the torch.